Unlike many parts of Edward Street, this block is almost unchanged since the first photograph here was taken in 1967. Did you ever live in this area? Do you remember any of the shops? Do you remember being able to buy a pack of cigarettes for 4/3d? The main difference I can see, is that in 1967 almost everyone needed the tobacconist, but almost no one knew what pizza was! So we seem to have swapped, unhealthy smokers for unhealthy eaters! My mum lived at 145 Edward St in the 1920s. Her family had come down to Brighton from the Bethnal Green/Hackney area and had rooms near here in Devonshire Place before moving to 145. Granddad was a corner of the street newsvendor, with a pitch outside the old ABC Savoy cinema (now Days Chinese Restaurant). The modern photo has it empty but I last recall it being a florists? Seems a bit over the top to call Pizzas unhealthy, and on a par with smoking, Peter! One wonders how the Italians have survived for so long on the Mediterranean diet! I didn’t say pizza was unhealthy, I did say that in 1967 most people didn’t know what pizza was; I think I ate my first one in the early 1970’s! The point is Stefan, that in 1967 tobacconists were everywhere, they have mostly disappeared, but now we have an overabundance of fast food outlets, which we didn’t have in 1967! I think that by 1967 everyone accepted the fact that smoking was unhealthy, and we did something about it. In 2015 I think its accepted that too much fast food is unhealthy (especially marketed at the young as tobacco was in 1967) but we are yet to do anything about it! The crisis in the NHS cant be understated; bad diet is causing a greater problem than smoking caused in the 50’s and 60’s and I would hate to lose the NHS! The Italians survive because they don’t just eat pizza, I also suspect that they don’t have gimmicks, like stuffing pizza crust with extra cheese! By the way, I love pizza, pepperoni please, but only occasionally! 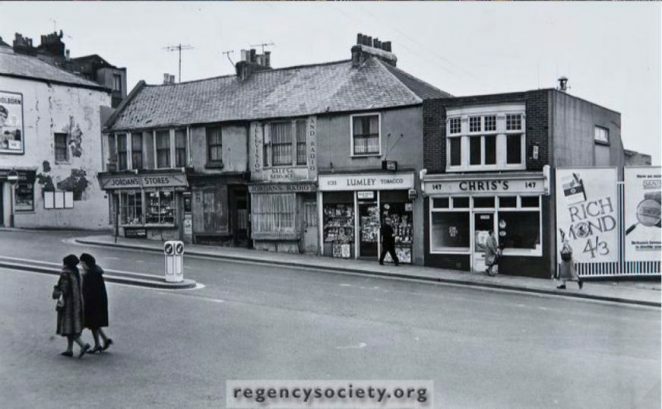 I remember this group of shops very well as I used to get off the number 41 or 42 bus at a nearby bus stop as my then girlfriend lived in High St. One of the family of the corner shop ‘Jordans’ attended my school Park Street. Of Lumleys the tobacconist I recall that the lady who served you who was Mrs Lumley had the most annoying grunt when she spoke. Chris’s chip shop was always busy when the pubs turned out. The queue was always out the door as there were many more pubs in the area then, and look at one of the ladies in the picture walking up Edward Street with a fur coat on, a big no no these days. I remember all these shops, I lived in 16 Devonshire Place and my grandparents lived in the basement of the house.I spent a lot of time walking up and down to Lumleys and Jordans. There was also a shop on the corner of chapel street we used and a pub further up where my parents had their wedding reception. I can remember the area behind the hoardings, there was an old air raid shelter in the waste land behind and we used to climb up the inside of the advertising boards to look at people walking in Edward Street. I visited the corner shop some time ago and Clive was in there who used to own Lumleys, I think he has gone now after many years at least 40 years.It was a nice area to grow up in and I have many fond memories. Editor’s note: Hey Neville – sounds like you could tell us a lot about how the area used to be. Why don’t you write down some of your memories and I will make a page like this for you and others can enjoy it? Email me? I lived at 24 Devonshire street - I remember the area well. The shop on the corner of Capel Street was run by an old lady and I think it was Burridge’s. The Pub was call the Alliance. I used to live in White Street. I was always in Chris’s queue out the door on Fridays. I remember old Ma Lumley with great affection. Jordan was rather more grumpy and the other corner shop at Chapel Street was Burrogh’s and run by another old lady. Clive James ended up with that store and Gordon James ended up with Lumleys. I was a paper boy at Lumley in 1975-76. I remember Mr and Mrs Lumley very well and their assistant Gordon. The guy who ran Jordan’s store was a bespectacled, balding man who we often made fun of. I recall him refusing to sell certain goods on Sundays because it was illegal to do so. I remember the old lady in the corner shop who, if I recall well, was very much hard-of-hearing. Up from these shops, I recall the bric-a-brac/antique store owned by a guy who was still working there well into the 2000s. 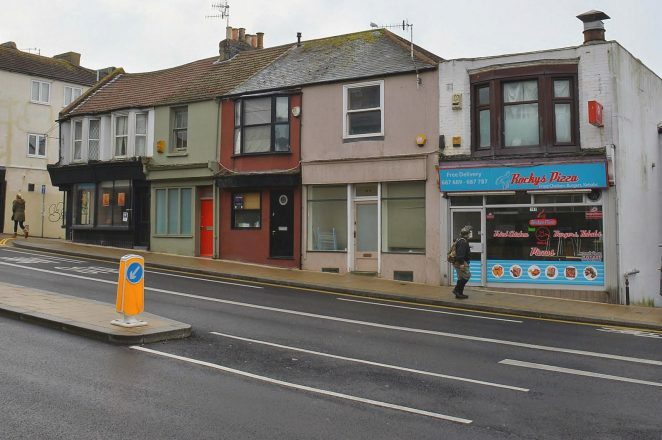 I can even recall the ever-empty shop opposite the bus stop just up from these shops being a kebab shop around 1973. Mr Lumley’s wife was rather nice to talk to. I remember their son, John, and his wife, a young blonde lady. At the time, I believe they lived in Upper Rock Garden where I lived between 1971-76. I guess Mr and Mrs Lumley are long gone. But I wonder if Gordon is still alive, bearing in mind he was rather young back in the 1970s? In 1945/6 I remember Lumleys in Edward St. being an ice cream/ice lolly parlour. It was all freshly decorated and new. My Dad was a partner with Bob Taylor opposite at Welfares Greengrocers. They lived in Queens Park Rd and we lived in White St.